Messy Lines goes to Light Night again. As expected, I was slightly intimidated when my guide to this year’s Light Night was delivered. It’s always a fun event, but there’s so much to choose from! Should I focus on one area of town, or hop around to the parts which interested me? What if everyone found something amazing but I missed it? Over a couple of beers and a pre-culture pizza on the night, I decided to stop worrying about it. 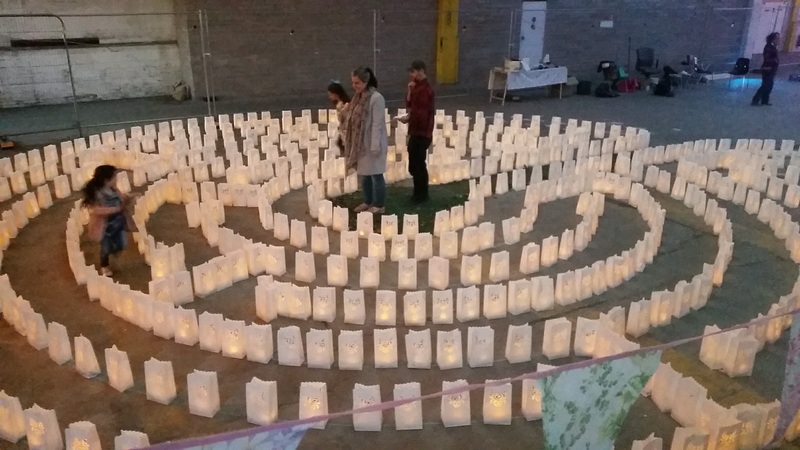 The theme of this year’s Light Night was “Time”, and we each only have so much of it. It seemed that the better idea may be to be a bit spontaneous and see where the night took us. To start with, we went to sit in the beautiful, spacious concert room and watch DUUOME 360 for a while. I enjoyed Atipyka’s work at the Black-E last year, and this was equally mesmeric whilst being a different, calmer experience. 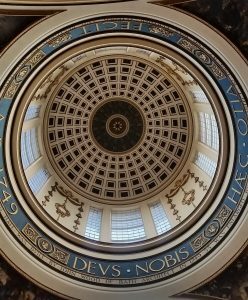 One of the only things I was definitely keen about seeing was the special commission Bloom, an audio-visual installation in the catacombs of St George’s Hall. I expected this to be popular and the guidebook agreed, advising us to turn up in plenty of time. But arriving 20 minutes before it was due to start, we were informed that it had been ticketed, and was completely sold out. For me and the many other people asking about the show, it was a huge disappointment. Also something of an organisational error; I’ve gone back through the guidebook and it nowhere does it mention tickets, which seems rather unfair. The Town Hall was one of those “how many times have I walked past it but never been in?” spaces. It hadn’t really been on my priority list, but as the bus drew close we saw people on the balcony, which made it seem worthwhile in itself. Liverpool, or Rome? 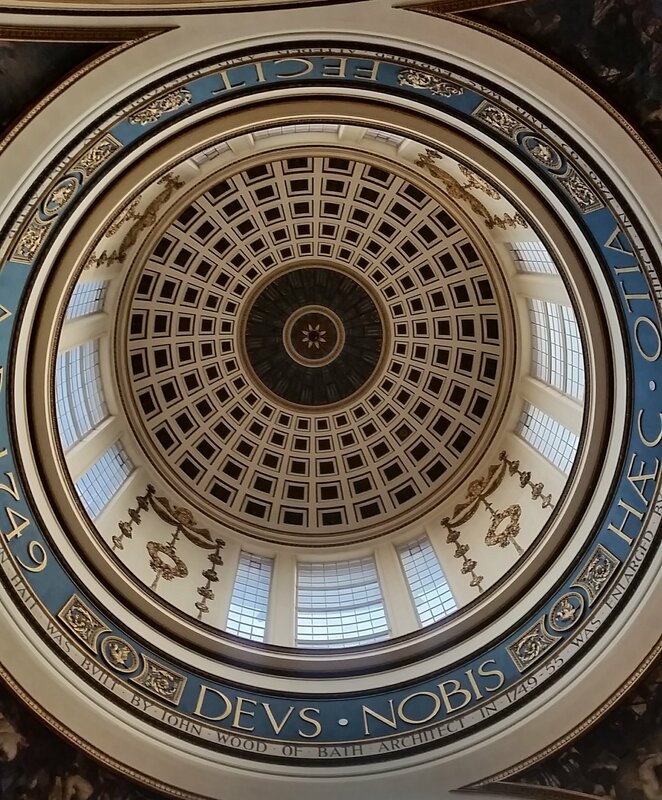 The dome of the Town Hall. What a place – surely one of the most beautiful buildings in the city, with the dome and chandeliers being real “wow” sights. Walking around the corridors and spaces was a discovery in itself. Quite a collection of different things were going on here. Downstairs we discovered The Memorial for Misused Time, a reflection on “missing”. Visitors could write their own ribbon for something they missed, are missing or will miss. Interestingly I think the word “miss” meant different things to different people, but the diversity of interpretation only encouraged more conversation about it. Upstairs, enjoying a prosecco and the views of Castle Street, a performance of Help Herbert Tweet. A 20-minute comedy, song and dance performance, it was very silly. That’s not meant as an insult – everyone likes a giggle. Whilst I think there was a plot, it wasn’t really important – the singing was excellent and the audience seemed to enjoy themselves. All aboard the Light Night bus, and onto the Baltic Triangle. The plan was to start at Northern Lights and work back along Jamaica Street. I was keen to catch “The Thinking Business” at The Royal Standard, and see what else was on offer. I was particularly intrigued by the sound of the Candle-lit Labyrinth. Well, “Time” may have been the theme of the evening, but we were rather bad at keeping it. By the time we got there, The Royal Standard has closed up. Once again, this timing hadn’t been well explained in the guide book – definitely seem like something for Culture Liverpool to consider next year. LJMU Screen School’s Candle-Lit Labyrinth. 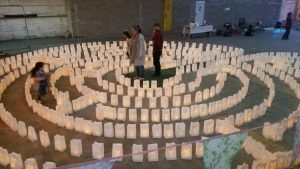 What about the Candle-Lit Labyrinth? Not quite what I expected – but also its own thing and actually, in retrospect, a decent reflection on time. It would be easy, as some people did, to merely jump over the candles from the entrance to the centre – but where’s the fun in that? There was something quite childishly fun about following the paths properly and making it about the journey, not the destination. A pseudo-philosophical life mantra indeed – but not necessarily true. It must have rubbed off on me because rather than rushing to more spaces, my evening concluded with a couple of very easy glasses of red wine at Alhambra. Sitting outside in the Cains Brewery courtyard and watching the light fade from the sky was a new and relaxing experience for me. It really was quite an atmospheric setting – like Liverpool’s version of a Central European castle courtyard. 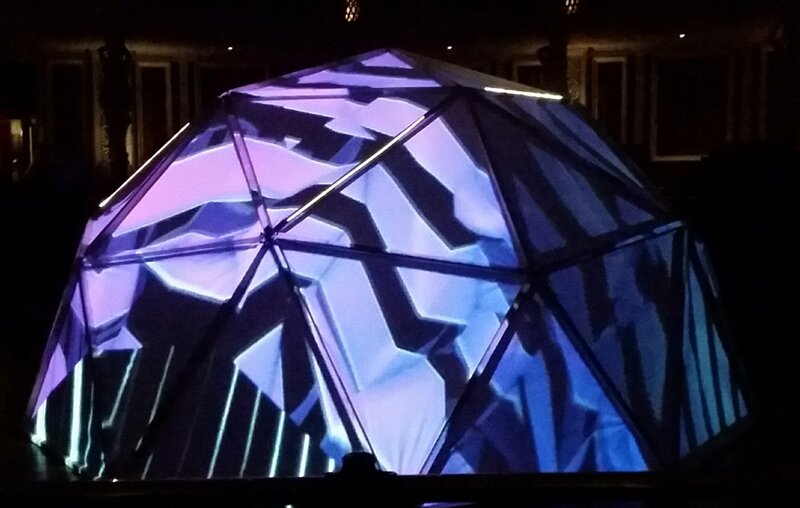 There’s part of me which feels like I should have seen and done more at Light Night 2017, I’m sure I missed out on some great things. But culture shouldn’t be a chore – I took the chances I wanted to when presented. At a night so full of possibilities, and with a few disappointments thrown in, I feel that in the true spirit of Light Night 2017, my evening was time well spent. This entry was posted in Exhibitions, Home, Past exhibitions and tagged 2017, art, culture, Light Night, Liverpool, time, wine. Bookmark the permalink.